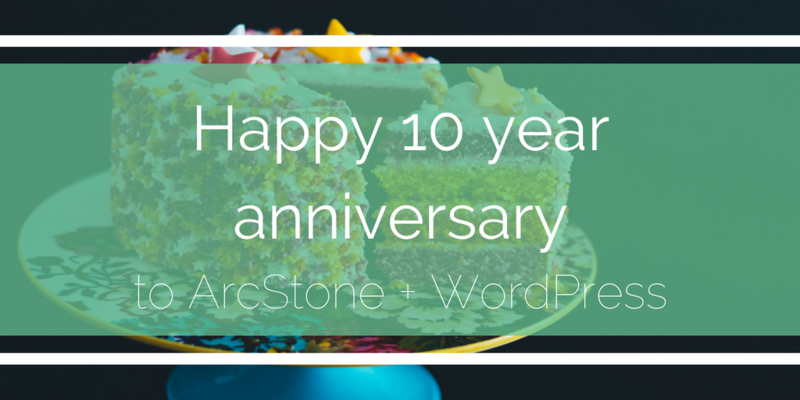 Last month we accidentally discovered that we’ve been on the using WordPress for over 10 years! The topic came up when I sent Alicia Cermak, our IT Director a Slack message casually asking her how long we’d been using WordPress. Being the detailed-oriented person she is, Alicia dug through email records to get me the exact date that we took the plunge with WordPress - September 18, 2006. We knew that it had been a while but we didn’t realize that it had been 10 years! Happy 10th Anniversary! What makes ArcStone your WordPress choice? Our team understands WordPress design & development. We are committed to staying in front of new WordPress updates. We create hand-crafted, custom WordPress sites. Our digital strategists know how to leverage WordPress to execute marketing campaigns. We follow stringent WordPress guidelines and best practices. Our team can offer WordPress strategy recommendations based on our years of experience. We offer WordPress managed hosting services. We’ll take care of WordPress updates so you don’t have to. Over the years, WordPress has pivoted and its functionality and user base have grown exponentially. We began using it just as others were using it in 2006, as a blogging platform. It was customary back then to use WordPress to compliment an existing website - for blogging. By the late 2000s, WordPress had added more features that allowed it to compete with more robust content management systems like Drupal and Joomla. By that time, ArcStone was using WordPress to manage entire websites and not just blogs. So, while quite a few of our competitors were recommending their own proprietary CMS platforms, we had already embraced this open system that offered flexibility, solutions for organizations without the large budget and an environment that encouraged evolution and growth. WordPress is a free, open source platform founded by Matt Mullenweg and Mike Little. Mullenweg and Little took source code from b2/cafelog and started independent development on it and created the very first version of WordPress. In 2005, Matt Mullenweg founded Automattic, Inc. (a play on his own name). Today, Automattic is behind WordPress, WooCommerce, Gravatar, Polldaddy and more. WordPress is extremely flexible. This is one of the reasons we like it so much at ArcStone. It works beautifully for nearly any type of website from a personal blog, a portfolio site, business website to an online presence for a non profit organization. Perhaps one one of the most compelling reasons we like WordPress so much comes down to shared goals. According to their website, Automattic’s common goal is to democratize publishing so that anyone with a story can tell it, regardless of income, gender, politics, language, or where they live in the world. This resonates with our values at ArcStone. Check out our full post on our history with WordPress and where we see the platform going in the future. Got a WordPress site? Trust ArcStone, the WordPress experts.